oficial albun en su solida edic org usa...con 12 temas increiblescomo , stop in the name of love,..etc...!!.. COLLECTORS.!!! todo en increible estado, nuestra mejor copia hasta el momento !! sin duda el mas popular grupo de chicas en los 60`s..con dian ross crearon toda una epoca y temas increibles...COLLECTORS.!!! 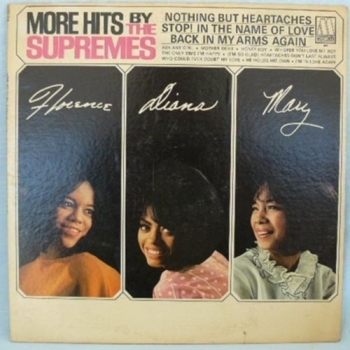 Tras la salida de Florence Ballard, el grupo pasó a llamarse Diana Ross & The Supremes, comenzando ahí los rumores de la carrera en solitario de Diana Ross. En 1967 introdujeron a su música ciertas influencias psicodélicas, que se pueden ver en "Reflections", dando al grupo nuevamente fama. Reflections is a 1968 released album recorded for Motown Records by Diana Ross & the Supremes, the first regular studio LP to display the new billing of the group formerly known as "The Supremes". It contains the singles "Reflections", "In and Out of Love", and "Forever Came Today." 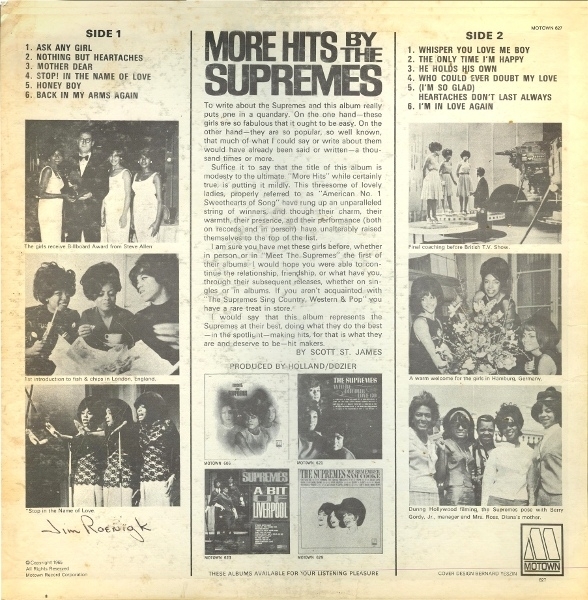 Also included are covers of songs made famous by Martha and The Vandellas ("Love (Makes Me Do Foolish Things)") and The 5th Dimension ("Up, Up and Away"). Also present are songs written by other famous names, including "What the World Needs Now Is Love" by Burt Bacharach and Hal David and "Bah-Bah-Bah" co-written by Motown songstress Brenda Holloway with her younger sister, Patrice. 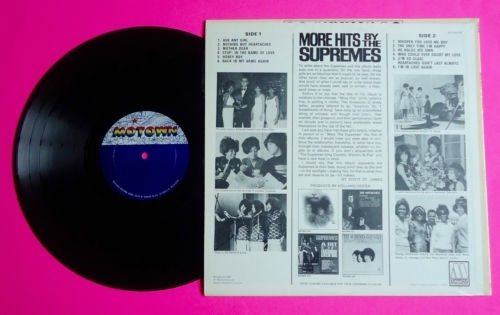 It also contains a cover of Bobbie Gentry's "Ode to Bille Joe", whose original recording kept the single "Reflections" from peaking at the number one spot on the Billboard Hot 100 in September 1967. The album includes the final songs the Supremes recorded with their main creative team of Holland-Dozier-Holland before the three writers/producers departed Motown over royalty and title disputes. Although Florence Ballard recorded some of this album before being fired from the group in June 1967, her replacement Cindy Birdsong along with Mary Wilson recorded several songs and appears on the album cover. One of the album's singles, "Forever Came Today", was later covered by The Jackson 5 on their 1975 album Moving Violation. ultra rara ORG. EDIT. USA MONO !! ultra rara ORG. EDIT. USA MONO !! collectors !! motown, ORG. EDIT. USA !! TOP COPY !! Smokey Robinson, ORIG. EDIT. PSYCH CARPETA ! !